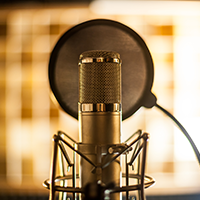 With the boom in podcasts and audio books, individuals and businesses alike are on the hunt for the best software for creating voiceovers and dubbing for their particular needs. In the old days, bulky and expensive audio equipment was needed to create a great sound. Today a computer, a mic, and user-friendly software will help you get started. There is a wide range of products available for every skill level. For example, if you are a beginner looking to start a podcast about your favorite hobby, you’ll want user-friendly equipment. However, for those in need of a high caliber, polished sound, such as what’s needed for an audio book or advertising, professional level software, skills, and equipment are necessary. To avoid becoming so overwhelmed that you abandon your goals, remember to keep it simple. Most computers will work well for home audio projects. Later, if you decide to upgrade, try to choose a computer that has a solid state drive (SSD) if you don’t already have one. This will reduce the mechanical noises of moving parts from seeping into your sound. Large screens and multiple USB ports are also a plus. Audacity: This program is available for both Mac and PC’s. You’ll be able to record, edit and export your audio files in the most used formats such as MP3, and .WAV. Garageband: Touted as one of the easiest software programs to use. It gives you up to 255 tracks, adjust timing and tempo and two layers of effects. It’s only available for Mac but allows file transfers to upgraded Apple products such as Logic Pro. Interestingly, microphones have changed very little over the years. The types used 50 years ago are still sought after today. But different microphones produce different sounds. One of the best for voiceover is a large-diaphragm condenser mic. Users agree that it is well suited to capturing the full tone of the human voice. A couple of good brand choices for beginners are the Audio-Technica AT2020 or the Rode NT1A. They are versatile options for any source of audio.You will also need a preamplifier to strengthen the signal of the microphone. Art Tube Opto 8 and Presonus Digimax D8 are good choices for home studios.The pop filters, which reduce the sound of air that spurts from your mouth when you pronounce certain letters or numbers are a must have as well. The Nady MPF-6 is inexpensive and has a gooseneck that actually stays in place. Another choice is the Avantone PS-1 PRO-SHIELD. It fits around the microphone helping to avoid the irritating problem of knocking it out of place. Apple MacBook Pro: Producers rave about the versatility of this laptop computer. You will be able to order it with the exact specifications you need to record. Lenovo ThinkPad: Considered a “tank” by many reviewers the Lenovo ThinkPad can handle all the RAM and processor speed you could ever need. Another plus – Lenovo also makes desktops if that’s your preference. Avid Pro Tools: If you’re looking for great support options and have the goal of turning professional, Avid Pro Tools may be the way to go. There will definitely need to be an investment of time for learning to navigate this or any professional level program to achieve the best results. But it is consistently ranked as one of the smoothest audio editing systems available. Which is why it’s a program of choice for Alta’s Voiceover Service. Users love it for its speed, new cloud-based collaboration feature, and it how wonderfully it works for any project including music, film, and broadcasting. Apple Logic Pro X for Mac: Users love the powerhouse capabilities of Logic Pro X and its relatively inexpensive price tag. Among the pros are its vast library of sound effects and instruments. It also has 63 GB of bundled content, unlimited audio track, and pitch correction. If that weren’t enough, it has a mixer view and a free version to try before you buy. Keep in mind; it’s only available for Mac users. The voiceover professionals at Alta Language Services prefers Neumann microphones. The quality is outstanding as each of its microphones is handmade and tested by trained staff in Germany. You’ll want to invest in a pop filter and/or a windscreen. While the pop filter is the better option for protecting the audio from sudden bursts of air, the wind filter is a good option for outdoor field recording. Neve Preamplifiers are another staple for the professionals at Alta Language Services to get the best possible sound from a microphone and bring the signal to line-level. With this basic knowledge of the software and tools necessary to record audio at the quality you desire, you should be ready to begin assembling your own digital audio workstation. But depending on your goals/needs, you might find it more cost and time effective to leave it to professionals to get the results you want.